During the annual DGK meeting in Stuttgart 2016, the Young Crystallographers hold their lightning session and a poster session. A small committee of established scientists selected the three best posters. One of these winners is Sandrina Meis, besides Manuela Gorgel and Gregor Hofer. Sandrina studied geosciences and specialized in crystallography at the Ruhr University of Bochum. During her master thesis with the topic “Analyse eines Experimentes zur Oberflächen-Röntgenbeugung an der Wasser-Pyrit- Grenzfläche“, Sandrina’s method of choice was GIXRD at mineral surfaces. After working one year witin the DFG-Projekt MA 4449/1-1 “Untersuchung der atomaren Struktur und Wechselwirkung von organischen Molekülen in Lösung an Pyrit- und Magnetit-Oberflächen mit Röntgenstreuung unter streifendem Einfall sowie numerischen Simulationen“ she started her PhD in 2011 with the working title “Untersuchung der Adsorptionsprozesse organischer Moleküle an Pyritoberflächen” in Bochum in the group of Prof. Dr. H. Gies. For her work, Sandrina was awarded with the EMU-Poster Prize at the IUCr conference in 2011 in Madrid, Spain. 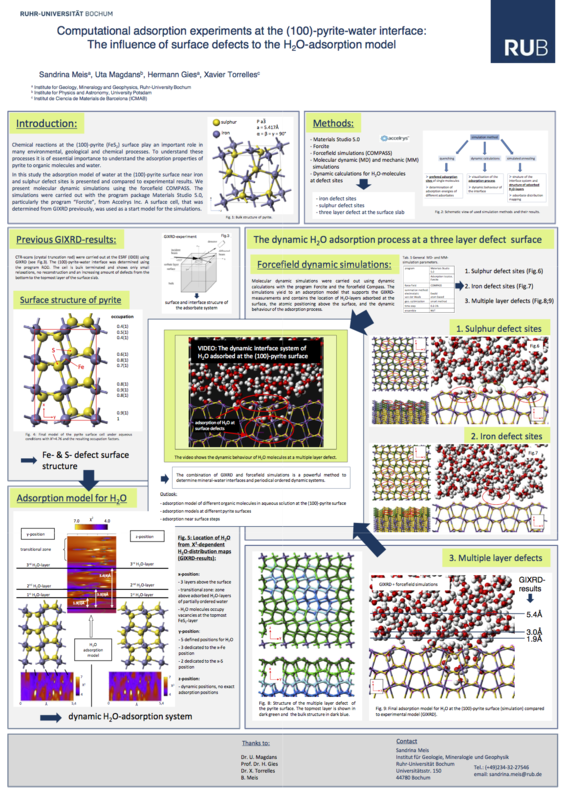 The topic of her poster was “The (100) pyrite-surface structure in dry and aqueous ambient conditions”. During her PhD, she got the chance to do a short research trip to the ICMAB Institute in Barcelona, Spain. After almost a break of two years due to pregnancy and parental time, She is now back at the University of Bochum to finish the last year of her PhD. Beside her scientific work, Sandrina is involved in the education at her institute. First as a tutor and since the start of her PhD, she is involved in different courses like „Introduction to Crystallography”, “Structure Determination Methods” and “Numerical Simulations and Solid State Modelling”. Have a look at her poster! Can you tell us a little bit about the research topic of your PhD thesis and your method(s) of choice for your investigations? Within my doctoral project, I study adsorption processes and interface systems between the mineral pyrite, water and simple amino acids at ambient conditions. The adsorption properties of pyrite to organic molecules are a very important part of the Iron-sulphur world scenario that describes one theory for the origin of life. In this scenario, pyrite surfaces are able to function as templates for organic molecules and water, so that molecules concentrate near surfaces and chemical reactions can take place. My studies are a bit like playing Tetris with the mineral surface as docking ground and organic molecules as building blocks. I want to get information about the interface structure and the most probable docking sites for water and organic molecules. My analysis of these interface systems are carried out with a combination of experiments and computational simulations, closing the gap between DFT-calculations and experiments at non-ambient conditions. I am doing especially a combination of GIXRD, carried out at the ESRF in Grenoble, and forcefield simulations. With GIXRD it is possible to get detailed information of the periodical ordered interface system. With forcefield simulations, I complement the GIXRD results with information about the dynamic adsorption processes, that are dominated by longe-range interactions. What fascinates you most about water adsorption on pyrite? The adsorption properties of the pyrite surface to water and organic molecules could be one reason why we all walk on earth today. That is a fact that is really fascinating for me. If adsorption of simple organic molecules at the pyrite surface under ambient conditions could be proved experimentally, it is also probable, that more complex organic molecules could be formed near surfaces, as precursors for the first living cell. It is not only the adsorption of water that is fascinating; rather the adsorption of different organic molecules at mineral surfaces in combination with water is interesting. As water is the surrounding medium in all these processes it is of essential importance to study the adsorption and the influence of water to the adsorption systems first. Additionally, the influence of surface defects to the adsorption model is very interesting because it shows how complex interface systems are in general. What was the biggest challenge of your research project so far and how did you solve it? The biggest challenge during my PhD was to get into the molecular modelling techniques and forcefield simulations. Because of my geoscientific background, it was a completely new method for me. It took a lot of time and nerves to master the program and to understand the theory behind the calculations. But finally, it yields awesome results for the different adsorption systems, perfectly fitting to the experimental results. At this point I want to thank my colleagues and my first and second supervisor for the motivating conversations that helped me through all occurred problems!! What was your greatest success with your research project so far? From a scientific point of view my greatest success was the moment when I realized, that my simulated data perfectly agrees to my experimental data and I got a coherent “picture” of the dynamic water-pyrite interface including surface defects. 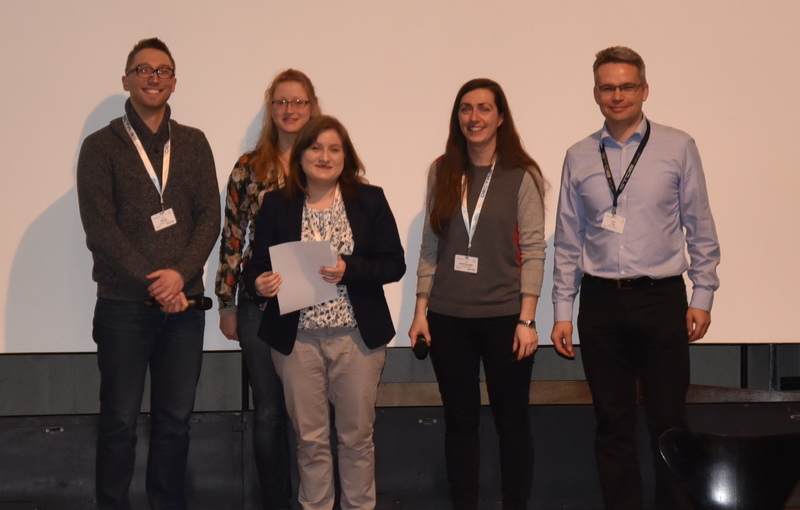 And of course, the poster prizes are a great success for me, because we are only a small group working on surface questions related to biomineralisation in Bochum. And because the combination of GIXRD and forcefield simulations is not often used to solve these kinds of problems, it is a great honour to get positive feedback from the scientific community. Have you had any special way to prepare your poster? I like to introduce a video to my poster by sticking a tablet in the middle of the poster. It is perfect for me to show dynamic processes at mineral surfaces and, of course, because it attracts a lot of people. By this method you could reach a broader audience for your research topic. Dieser Beitrag wurde unter AK-Junge-Kristallographie abgelegt und mit people, Young Crystallographers verschlagwortet. Setze ein Lesezeichen auf den Permalink.